Be the first to share your favorite memory, photo or story of Geri Danielle. This memorial page is dedicated for family, friends and future generations to celebrate the life of their loved one. 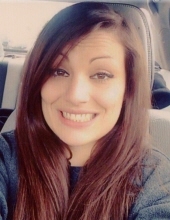 Geri Danielle (Bays) Johnson, age 29, of Williamsburg, Kentucky passed away on Saturday March 16, 2019 at Baptist Health in Corbin,Kentucky. Geri’s infant daughter, Amelia Jo Bays who was born on March 16, 2019 in Corbin, Kentucky passed away on Tuesday, March 19, 2019 at the UK Children's Hospital in Lexington. Geri was born on April 5, 1989 in Corbin, Kentucky to Sandra Faye Bennett and the late Jerry S. Bays. In addition to her father, Geri was preceded in death by her sister, Gwen Bennett. Geri is survived by her mother, Sandra Bowman of Williamsburg, Kentucky; three children, Hayden Blake Gambrell and Brenton Isiah Gambrell of Williamsburg, Kentucky; three sisters, Leigh Bays Donald (Phillip) of Georgetown, Kentucky, Edie Tye of Lexington, Kentucky and Lori Boggs (Tim) of Corinth, Mississippi; brother, Kenneth Bays of Georgetown, Kentucky; several nieces and nephews; and a host of other family and friends to mourn their passing. The Visitation will be from 1:00 P.M. until the funeral hour on Friday, March 22, 2019 at Croley Funeral Home. The Funeral Service will be held at 3:00 P.M. Friday, March 22, 2019 at the Croley Funeral Home Chapel with Rev. Billy Carpenter and Bro. Henry Carson officiating. Following the Service they will be laid to rest in the Wolf Creek Baptist Church Cemetery. To send flowers or a remembrance gift to the family of Geri Danielle and infant, Amelia Jo Bays Johnson, please visit our Tribute Store. "Email Address" would like to share the life celebration of Geri Danielle and infant, Amelia Jo Bays Johnson. Click on the "link" to go to share a favorite memory or leave a condolence message for the family.